Glowing, fragrant, deep orange-pink flowers light up the garden. Introduced in 1901 by Henry Eckford, who named it after the famous Victorian gardener. 2-3 plants per pot. 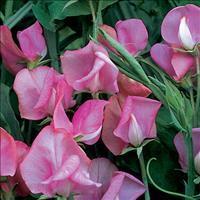 Bred by Morse in 1928, This lovely orange sweet pea has a pink blush to the opalescent petals. An old fragrant grandiflora, rare today, it needs the attention of gardeners to survive until its 100th birthday and beyond!